ScrapeRite blades do all the same jobs as razor blades but without the risk! For scraping, cleaning, and peeling, there are no better tools than ScrapeRite Plastic Razor Blades. Unlike metal razor blades, ScrapeRite Plastic Razor Blades will not damage surfaces, like paint and glass, when you scrape off decals, bird droppings, tree sap, and other sticky materials. Use ScrapeRite Plastic Razor Blades anywhere that you would use a steel blade. When you need to remove an old registration sticker or decal from your vehicle's glass, you probably reach for an old-fashioned steel razor blade. But what about bumper stickers on paint or chrome? A steel razor blade is just too sharp and too risky. You need ScrapeRite Plastic Razor Blades. ScrapeRite Plastic Razor Blades are hard plastic, double-sided razor blades with an easy-to-grip handle. ScrapeRite Plastic Razor Blades do all the jobs for which you'd use a regular razor blade, but the plastic blades are much safer on paint, glass, plastics, chrome, and all other surfaces. A steel razor blade can easily and deeply scratch auto paint, window tint, or chrome but ScrapeRite Plastic Razor Blades can do the same jobs with less risk of scratching or gouging. The automotive uses are endless! 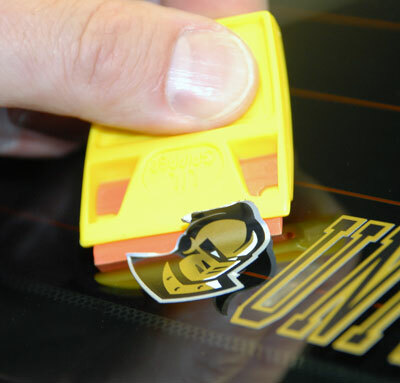 Use a ScrapeRite Plastic Razor Blade to safely remove stickers from auto paint and glass. ScrapeRite Plastic Razor Blades are made of hot injection molded plastic, which provides strength and stiffness. The plastic offers enhanced vertical and horizontal stability plus low moisture absorption. Plus, plastic has a low coefficient of friction, is long-wearing, and resistant to a wide range of chemicals and solvents. Unlike metal razor blades, ScrapeRite Plastic Razor Blades will never rust and they won't cause interference when used on electrical components. For automotive use, especially on the paint, mist the desired area with a clay lubricant or a quick detailer to lubricate the ScrapeRite Blade. Lubrication enables the ScrapeRite Blade to be even gentler on the surface, and the blade will last longer. Each ScrapeRite Plastic Razor Blade fits most standard household blade holders, but a blade holder is included. The blade holder is also made of plastic and gives you a more substantial edge to grasp. 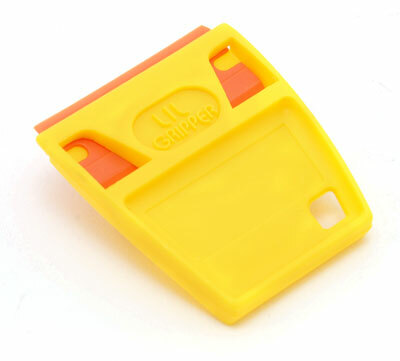 The general purpose orange ScrapeRite Plastic Razor Blades are flexible to conform to curved surfaces. The orange blades mold well to the surface being cleaned, such as a car panel or boat hull. Use them on auto paint, plastics, finished wood, and soft surfaces. Remember, ScrapeRite Plastic Razor Blades are double sided so with each package of blades you're getting twice as many usable edges. Use ScrapeRite Plastic Razor Blades for all your peeling, scraping, and cleaning needs in your home, garage, vehicle, boat, RV, aircraft - the uses are endless! ScrapeRite is your safe razor blade alternative.